If you asked me to pick my favorite game theme, I would have to say it is any that take place in Northern Europe. Being of Scottish/Irish heritage, I have a soft spot for any game that sets its scenario in that geographic region. It doesn’t matter if the theme is present-day and about different kilt tartans or about everything Ireland throughout history. I’ll give a game more than one look if it is covered in green (or plaid). Also included in this preference is anything about vikings. Our collection holds quite a few recent viking-themed examples such as 878 Vikings and Vikings on Board. 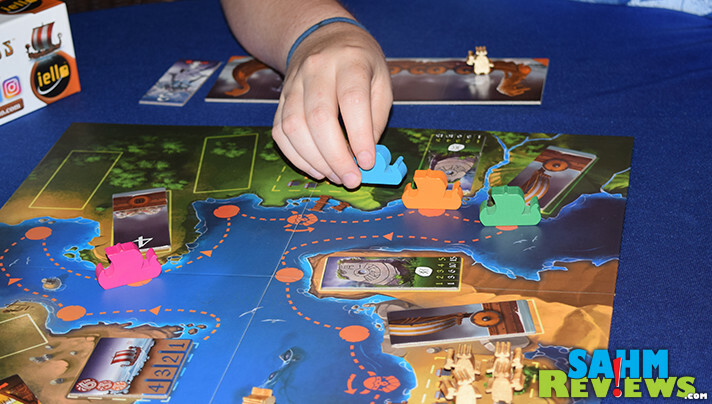 There’s always room for more, and that’s why we picked up a copy of iello‘s brand new Raids at this year’s Origins Game Fair where the game made its retail debut! Admittedly, it was more than just the Norse theme that piqued our desires. One look at the quality of the components and we knew it had good value over just the game play. 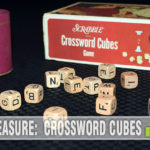 Metal coins, a spot-UV printed box, custom-cut wooden player pieces and thick cardboard tiles and board more than justified its acquisition. 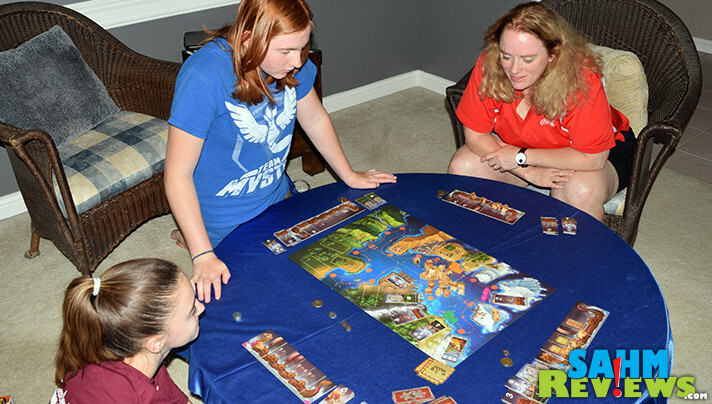 Upon further investigation, Raids turned out to be exactly the type of game we prefer to play – one where your moves not only impact your success, but can contribute to your opponents’ failures! In Raids, you must build the greatest Longship and gather the best Viking crew. 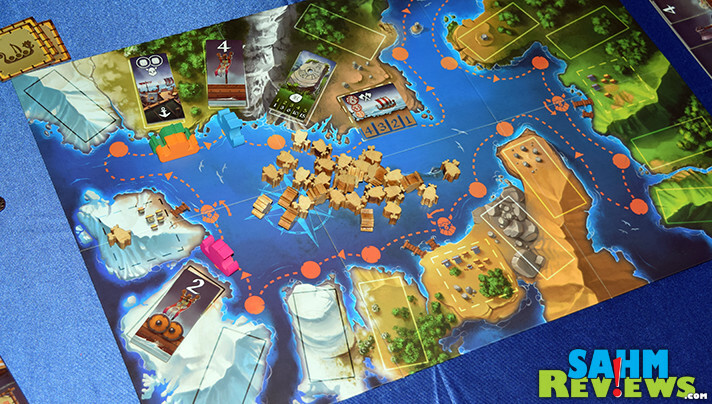 You will battle monsters, trade goods and try to visit valuable ports before your opponents. 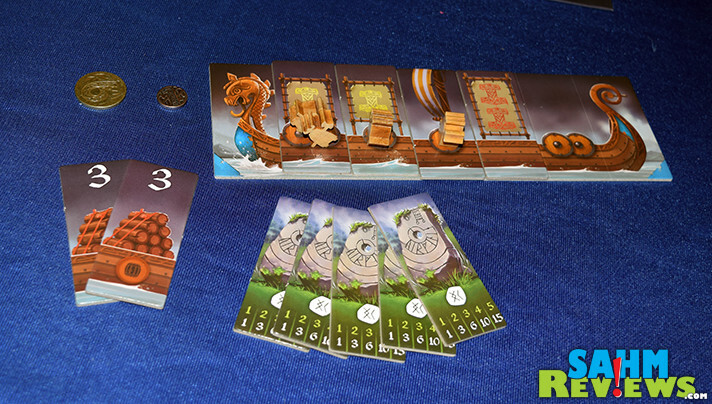 Each person (up to four players) receives a Longship board and matching colored wooden marker. 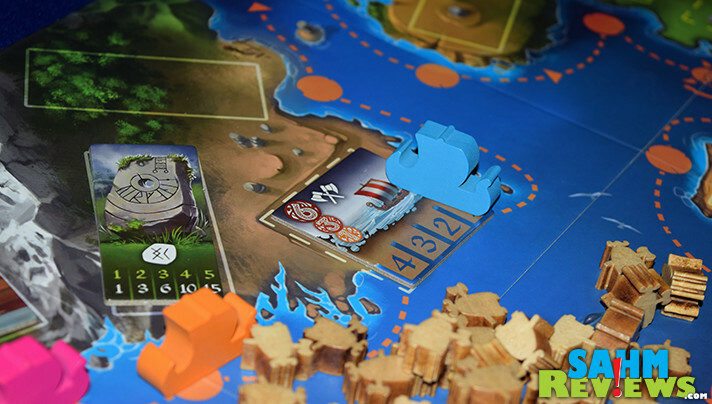 This wooden ship is placed on the starting space on the included board, which is pre-populated with randomly-selected Voyage Tiles designated for round one. A pool of recruitable Viking pawns is established in the center of the board, with pawns equal to the number of players being put in each of the villages. 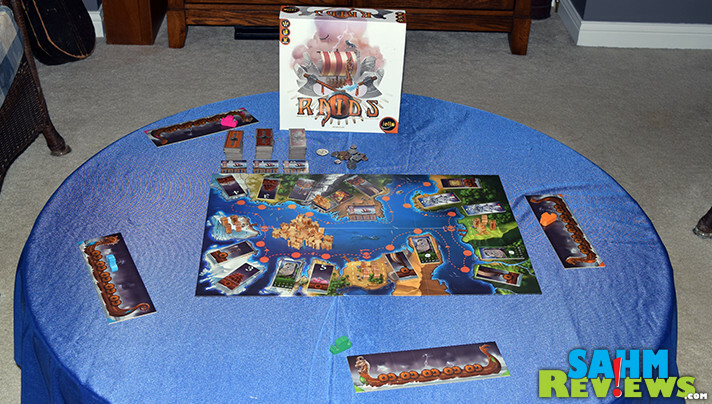 A game of Raids is played over four voyages (rounds). Each time you will leave from the starting area and finish your round once you make your way around the board back to this same point. 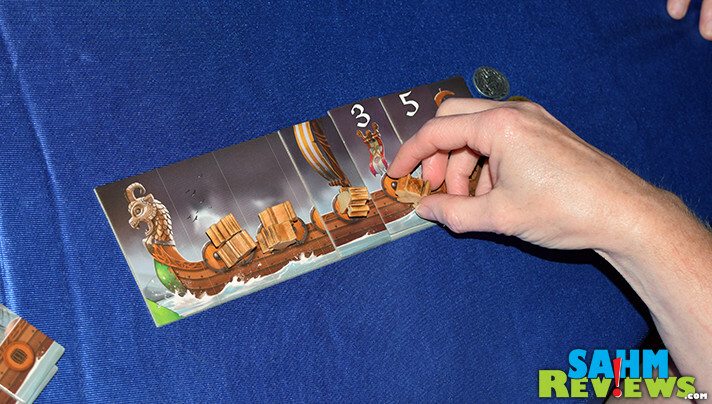 There is no dice rolling to move – you simply move your Longship as far as you would like on your turn, landing on any space. But I’m getting ahead of myself. The first thing you will do on your turn is take the Voyage Tile from the space in which you occupy (this won’t happen on the first turn, only subsequent turns). You place that tile in its corresponding space, on or next to your Longship. Weapons, sails, Mjollnir, pennants and goods are placed on any of the five middle spaces of your Longship board. You may place it on any of the empty spaces or replace a previously-placed tile. You may also discard it completely if you do not want it at all. Conversely, Rune and Port Tiles are placed next to your Longship and do not take up precious space. In addition, Port Tiles allow you to immediately sell one or two goods on your Longship, which are also unloaded to the side of your boat. The next phase of Raids is to move your ship. This is done in order of the person furthest behind. As previously mentioned, you may move your ship as far as you would like, maybe to a specific tile you have your eye on. Following the clockwise direction of the board, you will first discard all Voyage Tiles between you and the next player in front of you. Now you will navigate to the tile you want to visit. At a bare minimum, this will be the tile that the next-to-last person occupies. If you stop on an unoccupied tile, your turn ends. If there is another ship already on that location, you must fight that opponent. Combat is decided very simply. You first send one Viking (remove it from your ship) to do battle. Your opponent must then send two or flee from battle. If they send two, you must now send three in order to continue the fight, or also flee. Fleeing simply means you move your ship forward to another tile, even another occupied one (where you must fight again!). While moving, if you pass by a Village or a Visit or Pillage Tile, you will take whatever is listed and add it to your Longship. This will be additional Vikings or coins! If you pass by a Monster, you must either sacrifice one of your Vikings to the monster or fight it. To successfully defeat the Monster (and claim the tile), you must discard a number of Vikings equal to the Monster’s strength. Weapons on your ship can also be used to reduce the number of Vikings required! At any time you may sail all the way back to the Harbor and end your turns for the round. 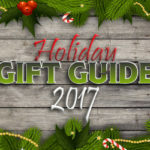 The first person to return to the Harbor will put their token in the smallest-numbered space and will move last at the start of the next round. Once everyone has returned, the person who has best fulfilled the condition on the Harbor Tile receives six coins. The next best receives 3 coins, with third place receiving one coin. 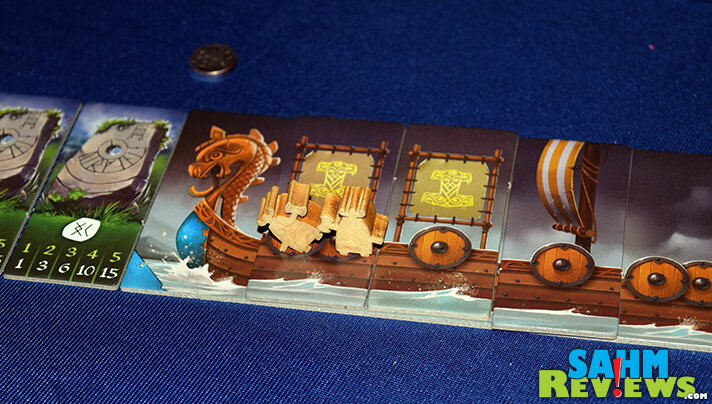 New Voyage Tiles are set out and everyone receives one new Viking for every sail they have on their Longship. After the completion of four rounds, the game ends immediately. Add up the points from earned tiles, Mjollnirs (times the number of Vikings), sets of Runes and number of coins. The Viking with the highest overall total wins this game of Raids! As a game, Raids does encourage battling with other players, but only if you’ve made preparations to have enough Vikings on board. If you are sailing light, you will quickly become the target of other players and be left with the tiles no one else wants! With a couple different ways to collect points, you shouldn’t be left too far behind – and there’s always the next round to get your revenge! 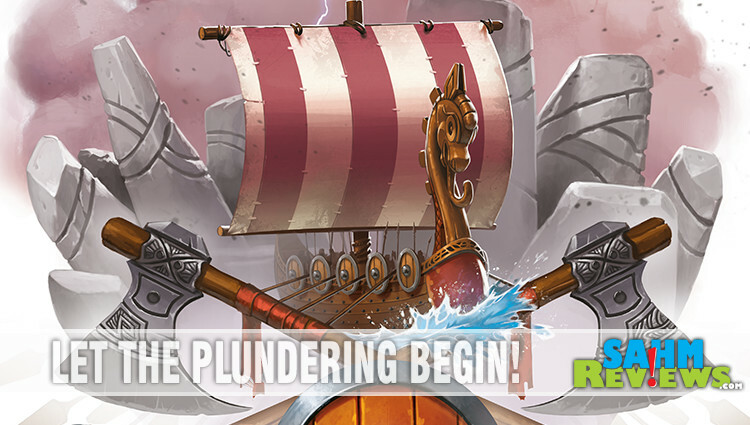 Retailing for right around $40, this brand new release from iello should be on the wish list of anyone who is fascinated with all things Viking. Raids isn’t the only thing iello has been working on – you’ll find more details about their next releases on their Facebook and Twitter timelines! And thanks to the generosity of iello, you have a chance to pillage your own copy of Raids in the giveaway below! Grab an entry while you can and don’t forget to come back tomorrow for additional entry opportunities! Sorry, missed the prompt. Personally, bring on the leviathans! Here there be monsters…. I’d rather fight another Viking Ship….monsters are scary! I think I would rather take my chances with another Viking ship. I would rather fight a monster! I guess given the choice between battling a monster and a viking ship, I would take the latter since it’s at least a known quantity. The monster could have any sort of power! Vikings are vikings sure, but they’re as moral as myself. 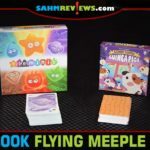 I like your reviews and photos that really show off and tell about the game. I’m interested in this one. Viking lore has some cool looking monsters so I’d say… a MONSTER!! I’d rather fight a monster…more epic. I would say Viking Ship. I would rather fight another Viking ship. A viking ship. Monsters are scary.